If you want to build a diversified portfolio of income-generating investments, you'll need high-yield bond funds to complement your dividend funds. When searching for high-yield bond funds, just be sure that you're not only looking for the highest yields. There are other qualities to consider when looking for the best funds to buy. Also known as junk bonds, high-yield bonds are bonds that pay higher yields because of low relative credit ratings. More specifically, the bonds, or the entities issuing the bonds, have credit quality ratings below investment grade (a rating below BBB by Standard & Poor's or below Baa by Moody's credit rating agencies. AAA is highest). A bond can receive a lower credit rating because of the risk of default on the part of the entity issuing the bond. Therefore, because of this higher relative risk, the entities issuing these bonds will pay higher interest rates to compensate the investors for taking the risk of buying the bonds, thus the name high yield. Think of a personal credit score. Borrowers with poor (lower) credit scores generally pay higher interest rates on their loans or credit card balances than the borrowers with good or excellent credit. It's the same concept with the issuing entities of bonds, which can be corporations, publicly-owned utilities, and state, local and federal governments. Before buying high-yield bond funds, or any other investment, there are a handful of considerations to make during the research and analysis. Type of Account: If the fund is going to be held in a taxable account, you may want to consider buying a high-yield municipal bond fund, which will produce income that is free of taxes at the federal income level. Taxable income is not a consideration for tax-deferred accounts, such as IRAs and 401(k)s because the income is not taxable to the investor while the high-yield bond fund is held in the account. Tax Bracket: Reinforcing and clarifying the preceding point, tax-free bond funds are especially beneficial for investors in higher tax brackets, where minimizing taxable income is likely a higher priority, as compared to investors in lower tax brackets. 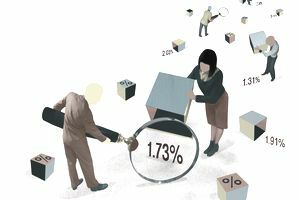 To measure the benefit of using tax-free bond funds, investors can calculate the tax-equivalent yield, sometimes called the tax-effective yield. Risk Tolerance: High-yield bond funds can have stock-like returns, meaning that performance can average higher than conventional bond funds; however, declines can be more severe. For example, in 2008, the peak calendar year of the credit crisis, most high-yield bond funds declined 5 percent to 10 percent, whereas most conventional bond funds had increases of 5 percent to 10 percent. In the following year, 2009, high-yield bond funds jumped 10 percent to 20 percent, while conventional bond funds remained steady at a range of 5 percent to 7 percent. Bottom line: If you're not OK with volatility in price, high-yield bond funds may not be the best choice for you. A better consideration may be a bond index fund like Vanguard Total Bond Market Index (VBMFX), which tracks the Bloomberg Barclays US Aggregate Bond Index. Other Portfolio Holdings: Although high-yield bond funds are higher in market risk than conventional bond funds, they may fit in well with a diversified portfolio of mutual funds. For example, if you already have a bond index fund, as well as a variety of stock funds, a high-yield bond fund could be a good compliment that adds diversification to your portfolio. Since there is no one-size-fits-all high-yield bond fund, we highlight ten standouts that can be a fine addition to complement a diversified portfolio. Vanguard High-Yield Tax-Exempt (VWAHX): If you're looking for high yields and you want to minimize taxable income with a low-cost, no-load mutual fund, VWAHX may be the best fit for your needs. The portfolio consists of more than 2,000 municipal bonds, which are tax-free at the federal level. The SEC Yield for VWAHX is 2.87 percent and the expense ratio is just 0.19 percent, or $19 for every $10,000 invested. The minimum initial investment is $3,000. As is the case with most Vanguard mutual funds, you can get a lower expense ratio if you buy Admiral shares, which usually have a minimum initial investment of $50,000. Vanguard Long-Term Investment Grade Bond (VWESX): Along with high yields, investors should expect higher market risk, compared to the average bond fund. However, VWESX has a good combination of high yield and lower relative risk compared to the junkiest of bonds. Long-term bonds generally pay higher yields than short- and intermediate-term bonds and the average credit risk for bonds in VWESX is just slightly below investment grade credit quality. The current yield for VWESX is 3.57 percent, the expenses are just 0.22 percent, and the minimum initial investment is $3,000. Caution on long-term bond funds: The interest rate risk is higher than bond funds that hold bonds of lower average duration. Translation: Prices could fall in a rising interest rate environment; however, long-term performance is expected to be higher than shorter duration bond funds. T. Rowe Price Corporate Income (PRPIX): Another top bond fund that pays decent yields without taking on too much credit risk is PRPIX. Also, being an intermediate-term bond fund, PRPIX doesn't carry as much interest rate risk as long-term bond funds. Combine these top qualities with low expenses (0.60 percent) and experienced management (since 2003) and you have one of the best high-yield bond funds to buy. The minimum initial investment for PRPIX is $2,500. Fidelity High Income (SPHIX): If your highest priority is yield, SPHIX is a good choice. The current yield of 5.23 percent is among the best for bond mutual funds, and the expense ratio of 0.72 percent is reasonable; however, the credit quality of most of the holdings is below investment grade. Therefore, if you're looking for a good junk bond fund, SPHIX is definitely worth a look. The minimum initial investment is $2,500. Fidelity Short Duration High Income (FSAHX): Investors wanting high yields but low-interest rate risk will want to take a look at FSAHX. The low credit quality creates its own market risk but the trade-off is a high yield (4.03 percent) and the short-term average duration minimizes interest rate risk, which is especially pronounced in a rising interest rate environment. Expenses for FSAHX are 0.80 percent and the minimum initial investment is $2,500. Fidelity Capital & Income (FAGIX): This fund is unique in the high-yield space in that it allocates a portion of assets (about 20 percent) to dividend stocks. This exposure to equities adds a bit of market risk but it can also juice performance over time. The current yield for FAGIX is 3.60 percent and the expense ratio is 0.73 percent. The minimum initial investment is $2,500. Vanguard High-Yield Corporate (VWEHX): Investors looking for high yields and wanting to take the added risk to get them, will like what they see in VWEHX. Most of the portfolio consists of bonds below investment grade but the yield of 4.78 percent and low expenses of 0.23 percent may be a happy trade-off for high yield investors. The minimum initial investment is $3,000. Vanguard Long-Term Corporate Bond Index (VLTCX): If you love low-cost index funds and you want high yields, VLTCX should be on your short list for an addition to your portfolio. Although this fund is only available in Vanguard's Admiral shares, which means you'll need to meet the minimum initial investment of $10,000 to get started, the low expense ratio of just 0.07 percent and the current yield of 4.07 percent make this fund worthy of your consideration. California Long-Term Tax Exempt (VCITX): Although VCITX is a state municipal bond fund, the income from the fund is free of tax at the federal level and at the state level (if you live in the state where the municipal bonds are issued). Municipal bond funds don't always offer the highest yields. But when you live in a state with high taxes, the state and federal combined tax-effective yield can be significant. The yield for VCITX is 2.30 percent. When you factor in the tax-equivalent yield, it climbs to nearly 3.5 percent. Expenses for VCITX are 0.19 percent and the minimum initial investment is $3,000. New York Long-Term Tax Exempt (VNYTX): For the same reason VCITX can be a smart choice for high-yield investors in California, New York investors may consider VNYTX. Remember that the benefits of tax-exempt funds are only for taxable accounts. The yield for VNYTX is 2.27 percent and the combined tax-equivalent yield for most New York residents would be higher than 3.0 percent. The expenses for VNYTX are 0.19 percent and the minimum initial investment is $3,000.